I always wondered what all the fuss is about where truffles are concerned. A luxury food item only a few can afford, does the particular flavour and aroma this fungus brings to a dish justify its exorbitant price tag? Or is it all about the bling? An invitation from Celebrity Cruises fuelled my curiosity – I was to accompany their executive chef John Suley to Alba, the Italian capital of white truffles. There I would learn about this magical fungus, cook with it, eat copious amounts of it, and even bid for it, but more of that later. So this is what happened. The town of Alba is in the northwestern Commune of Piedmont (or Piemonte in Italian), one of the 20 regions of Italy. As the name suggests, Piedmont (at the foot of the mountain) is a hilly, mountainous region that is completely landlocked. Perhaps because of this, Piedmont is not one of the most well known regions with most foreign travellers preferring to stay put in Liguria’s neighbouring stunning Riviera. But this all changes when Alba’s white truffle season is on. Between the end of September and January each year, gourmet travellers from around the world flock to Piedmont in search of the seasonal fungus, with the International Alba White Truffle Market and the Annual Auction in November as the highlight events of the season. The white truffles of Alba are available everywhere, from the simplest trattorie (family-run cafes) to the most sophisticated Michelin-starred restaurants, for breakfast, lunch and dinner. The International Alba White Truffle Market takes place over 6 consecutive weekends (Saturday and Sundays only) between October and November each year. In its 84th year, this is a great place to learn about and savour the local delicacy, meet and talk to the hunters and buy their finds directly from them at a better price than you would find in the local shops. 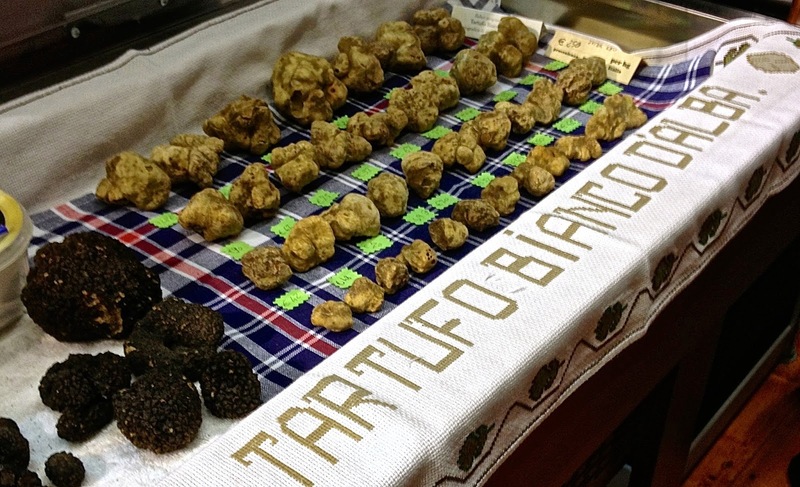 Prices vary according to the quality grade and size of the truffle - this could be anything from €150 to €250 for 100g. Having said that, I did buy two 50g pieces for €100 after haggling for a discount, so do ask! There was a large number of stalls selling other regional products as well as truffle-based ingredients including pasta, salt, oils and biscuits, truffle-infused honey, fresh salami and cheeses with truffles. This part of Piedmont (Langhe and Roero) is famous for its hazelnuts (one of Nutella’s key ingredients) used in the local nougat known as ‘torrone’, and also for cheeses particularly the Toma and Sabauda, all of which were on sale at the fair. All truffles being sold at the fair were inspected by a team of judges, so whatever you buy is guaranteed to be at the peak of freshness. An added service provided by the fair organisers is the possibility of having your purchases examined by a judge. I took my two pieces of white truffle to an Italian judge who assessed them for me, and pointed out that although they were both of great quality, they were very different in aroma and flavour – one being much more garlicky and heavily scented than the other. She pointed out was that both were quite firm which is an indication of freshness or ripeness, and explained that softer or crumblier truffles are usually past their best. To find out more about the International Alba White Truffle Fair, and the many events and activities and for dates for 2015, please visit their website on www.fieradeltartufo.org. As with most regional cuisines in Italy, the Piemontese have strong opinions on how their ingredients should be prepared, and rightly so as they have been using them for centuries. In Piedmont, truffles are never cooked (unlike in France). Truffles can be washed but not peeled; they are finely shaved but never grated over cooked food. The lifespan of a truffle is rather short – 7 to 10 days maximum, and it should be stored wrapped in kitchen paper in an airtight jar, with the paper being changed every other day. In Piedmont, there is a handful of ingredients that are commonly used to partner with truffles - these include eggs, cheese, pasta and raw meat. Most restaurants will serve their own interpretation of dishes using these very same ingredients, with only a few daring to do anything remotely different. I enjoyed ‘Fonduta’, the rich Piemontese fondue made from Fontina cheese, egg yolks, milk and butter with shavings of truffles served on top. Fried eggs and plain buttered pasta are also excellent in combination with truffles. We had a few of these dishes at the white truffle fair itself. Celebrity Cruises’ executive chef John Suley cooked one of the best truffle dishes I ate on this trip at a truffle cooking demonstration at the University of Gastronomic Sciences in Pollenzo, a great learning institution, but more of that later. This was a magnificently creamy risotto with roasted quail, mushrooms and plenty of white truffle shavings, and was quite different to anything we had tried so far in the various restaurants of Piedmont. I enjoyed this immensely and it was one of the dishes I recreated using the truffles I had bought at the international Alba white truffle fair when I got home. The truffle cooking demonstration by John Suley was followed by a fantastic lunch cooked by the man himself. Of note was his silken cauliflower cream soup with crispy pancetta, mascarpone cheese and croutons, whose recipe I replicate below. The soup was delicious and I thoroughly recommend cooking this at home with some excellent quality Italian truffle oil in lieu of the fresh white truffle shavings. This was followed by a refreshing salad of warm artichoke hearts, fennel, tomatoes and greens with a gorgeous burrata cheese topped with white truffle shavings. Another noteworthy dish was John’s braised veal cheeks on a bed of soft polenta, served with mushrooms, rapini (turnip greens), Parmesan cheese and white truffle shavings. The meat was wonderfully tender and richly flavoured partnering well with the polenta but sadly overpowering the subtle aroma and flavour of the white truffle. For dessert we had a light olive oil cake served with ricotta, lemoncello sorbet and caramelized Piemontese hazelnuts, which ended our meal on a high note. If you haven’t been on a truffle hunt, this is a must-do activity when visiting the region during the white truffle season. Headed by a Trifolau (truffle hunter in Piemontese dialect) and his highly trained dog, this can be incredibly exciting, especially when truffles are located. On our expedition, we (or rather the dog) found two white truffle pieces - a 10g piece and another - a whopper 150g nugget! The event with the highest bling factor on the Alba’s white truffle season calendar is undoubtedly the World Truffle Auction taking place at the magnificent Castle of Grinzane Cavour (http://www.castellogrinzane.com/ing/). 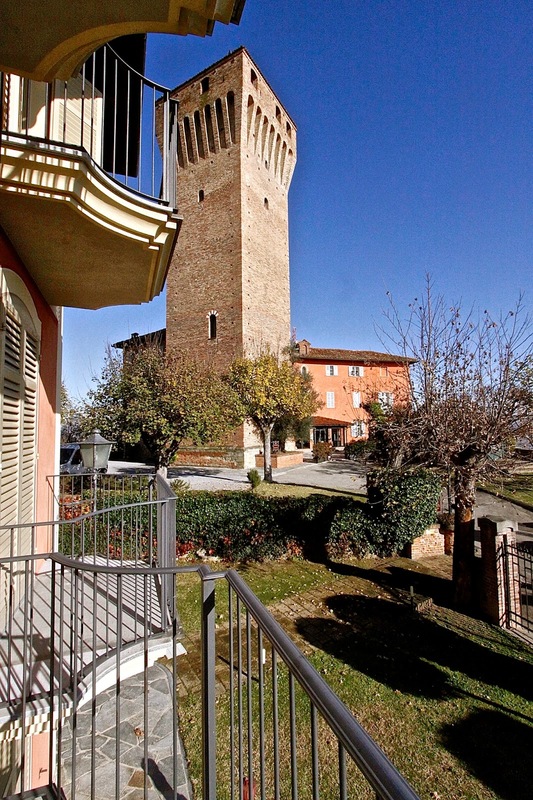 The Castle sits in one of the most spectacular settings in Langhe, with breathtaking views of the city of Alba. It houses the “Cavour Regional Enoteca” (a wine emporium) where the best Piemontese wines and grappa can be purchased and the one Michelin starred restaurant “Ristorante al Castello” by chef Alessandro Boglioni. Only a very limited number of tickets are available for the annual World Truffle Auction and these are carefully allocated to potential buyers, politicians, artists and local businessmen. As a potential buyer Celebrity Cruises was sold a handful of these coveted tickets, which allowed us access to the auction, followed by a wonderful lunch at Ristorante al Castello. John Suley bid and won 2 of the 6 lots in the auction for Celebrity Cruises. 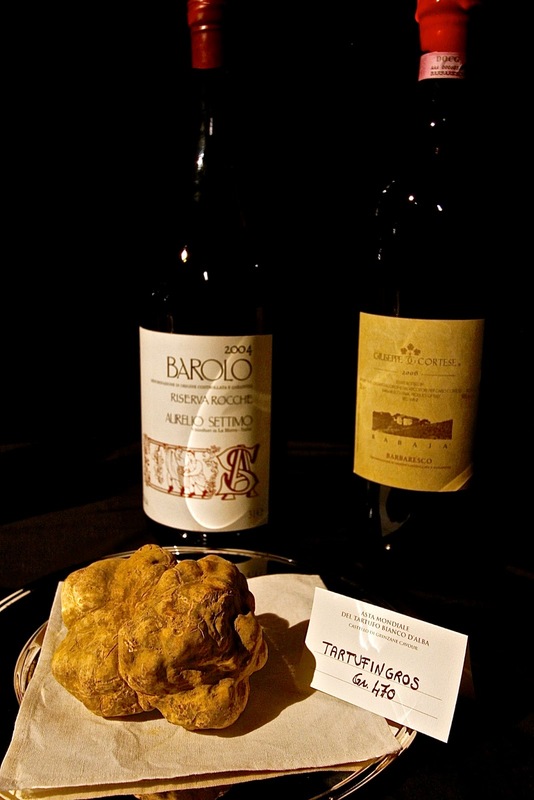 Each lot included a large truffle of about 500g, plus magnum bottles of vintage Barolo and Barbaresco wines. The lots were snapped up for €5,000 and €10,000 respectively which appeared absurd amounts of money to pay until the big daddy, the final lot of a 1kg truffle, was purchased for €100,000 by a buyer in Hong Kong, bidding via satellite! The big daddy 1kg truffle piece being brought in by Miss Smile! Interestingly, a similar sized white truffle of Alba was auctioned at Sothebys in New York a month later fetching only around half of that amount, about €50,000. There is more though to Piedmont than its white truffles, for it is also home to one of the most iconic wines of Italy or indeed the world – Barolo. 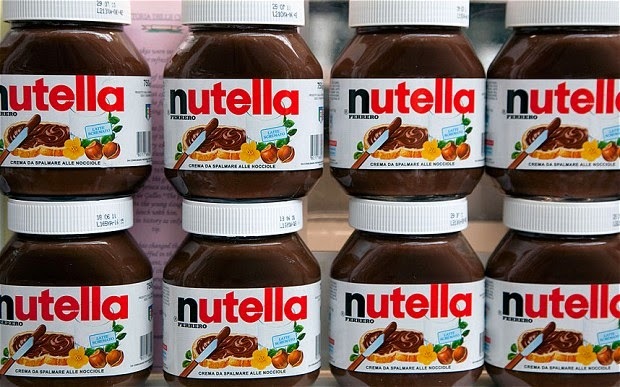 But the region’s claim to international fame does not stop here – Piedmont is also where the chocolate company Ferrero SpA – the makers of Nutella and Ferrero Rocher is based. 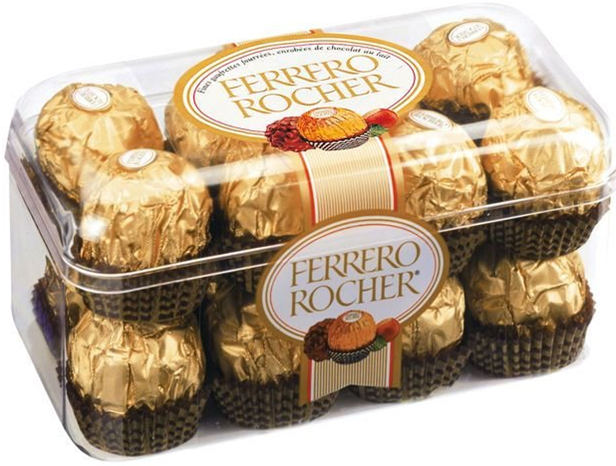 Surprisingly, the company is still privately owned and run by the Ferrero family. The company’s current CEO Giovanni Ferrero is Italy’s richest man, or so I am told by Nicoletta, our all-rounder Italian interpreter, organizer, time-keeper, money-lender and friend. Nicoletta’s enthusiasm and knowledge for her home region and its produce made this trip to Piedmont very special. Hotel Castello di Santa Vittoria occupies the grounds of the eponymous castle dating back to the 14th century in the minute village of Santa Vittoria d’Alba. It is a beautiful hotel offering breathtaking views of the surrounding valleys and vineyards. This was home for the duration of our trip and was a good base to explore the nearby towns of Alba (6 miles) and Bra (5 miles). The hotel has a fantastic selection of regional wines for sale and friendly staff who could not have done more to make our stay as comfortable as possible. If you plan to visit the region, Hotel Castello di Santa Vittoria is worth checking out (http://www.santavittoria.org/). A few minutes walk from the hotel was Osteria della Pace, where I headed for my first taste of Piemontese cuisine in this trip. This is a simple, family-run restaurant offering home-style cooking at surprisingly reasonable prices. I thoroughly enjoyed my lunch at Osteria della Pace, particularly their risotto with Dolcetto red wine and Toma cheese (€7) – this is a traditional Piemontese dish, more commonly made with Barolo wine. Toma cheese is another great ingredient of the region; it is a PDO, full flavoured and creamy cheese made from unpasteurized cow’s milk. If you think the combination of red wine and cheese as a base to flavour risotto is an odd one, you ought to try this dish. It was a revelation! (Osteria della Pace, Via Bertero 10, Santa Vittoria d'Alba, Italy). Next stop was a visit to the winery Fontana Fredda, one of the region’s state-of-the-art wineries, with over 150 years of history. We were given a grand tour of the cellars, wine shop and what seemed like every nook and cranny of the place until we finally sat down for a tasting. 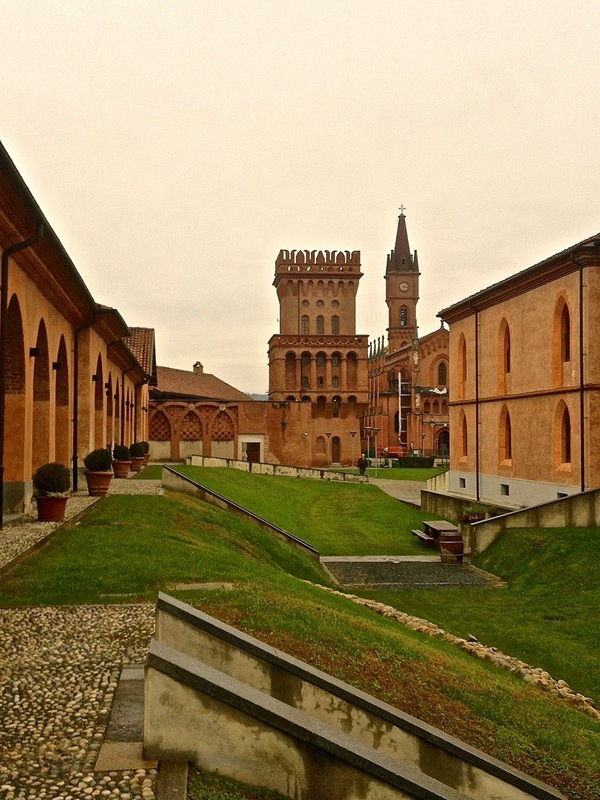 Even though Turin is the capital of Piedmont, Alba is the heart of the region when it comes to wine making. A huge generalization, but one that I always remember, is the order in which Piemontese red wines are placed in terms of importance, elegance and price – ascending from Barbera to Dolcetto, then Barbaresco and finally Barolo. Dolcetto and Barbera are both grapes making wines bearing the same name, whilst Barbaresco and Barolo are made from the Nebbiolo grape. Another important Piemontese grape is Cortese, from which Gavi white wine is made. Moscato (muscat) is also used for sparkling Asti Espumante in the region. Tasting at Fontana Fredda, those spittoons mean business! Back at Fontana Fredda’s tasting room, I enjoyed their 2010 Barolo Serralunga D’Alba (£30/bottle), a magnificent Barolo aged for 3 years with an intense red colour, notes of red cherry and pronounced but fine tannins. 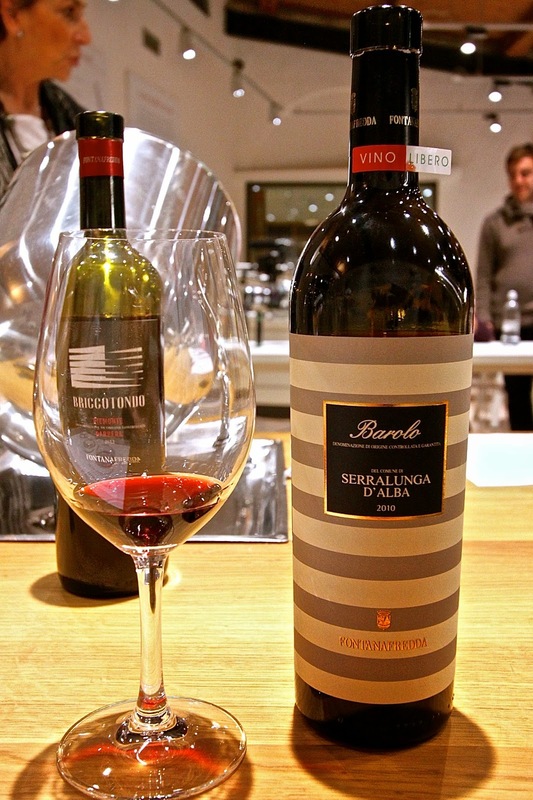 According to DOCG regulations Barolo must be made from 100% Nebbiollo grapes and be aged for at least 2 years in barrel and 1 year in bottle or tank, so a minimum of 3 years of aging (http://www.fontanafredda.it/web/en/home/). The venue for the white truffle cookery demo and lunch by John Suley of Celebrity Cruises was the University of Gastronomic Sciences in the town of Pollenzo (http://www.unisg.it/en/). Founded by the Slow Food Movement (http://www.slowfood.org.uk/) this is a stunning international university offering both undergraduate (3-year Gastronomic Science degree) and postgraduate courses. These are taught in English, and include a Masters in Italian Food and Wine Culture, as well as food entrepreneurship and tourism related courses. Adjacent to the university is La Banca del Vino (The Wine Bank) founded in 1835 originally as the headquarters for viticulture experiments for the royal estates of Savoy. Today, this beautifully restored building is a co-operative and museum where special Italian wines are selected and stored, and tastings and workshops are offered. English speaking guided tours and tastings are available to the general public from €6 to €18. For more information, visit their website on www.bancadelvino.it. So to return to the question I first posed, there clearly is an element of bling associated with the consumption of truffles, and whether its price tag is justified or not depends on a personal perspective. Truffles have a unique flavour and aroma, and personally I love them. Having been on this trip, I am even more interested in learning about, cooking and eating more truffles. A visit to Piedmont during the white truffle season is a fantastic opportunity to experience the region and its food and wine, and to snap up some truffles at the International White Truffle Fair, at well below the UK rate. While I cannot vouch for the level of culinary accomplishment on Celebrity Cruise ships (as I have yet to go on one), I found the initiative of bringing the magical funghi of Alba to the ships’ menu commendable. Judging by the excellent food I ate, cooked by Celebrity Cruises’ executive chef John Suley, passengers on Celebrity Cruises will be in for a treat, if the truffles are to be served up there. For more information about Celebrity Cruises visit their website at http://www.celebritycruises.co.uk/. Heat butter in a large pot over medium-high heat. Add the diced onions and shallots and reduce heat to medium. Cook and stirring occasionally, until the onions are very soft and then add the garlic. Cook for around 3 to 5 minutes and stir until the liquid has almost completely evaporated. Stir in the cauliflower and chicken stock and bring to a boil. Reduce heat to a simmer, cover, and cook for around 20 to 25 minutes until cauliflower is very soft. Slowly blend the ingredients in a blender for at least 3 minutes until very smooth. Depending on the size of your blender, you may need to do this in a few batches. Then season to taste with salt and white pepper before finishing with freshly chopped thyme and parsley. Add mascarpone at the end to get the best results. Cook the diced pancetta in a frying pan until crispy. Then take the cubes of ciabatta and rub them in a mixture of olive oil and parsley. Place them on a baking tray, add the cubes of butter and roast in the oven for 10 minutes at 220 degrees to give them a nice colour. Once cooked, drizzle with white truffle oil and add shavings of the white truffle (if using) to garnish. Many thanks to Celebrity Cruises for inviting me along to this truffle adventure! I am going to try "John’s braised veal cheeks on a bed of soft polenta, served with mushrooms, rapini (turnip greens), Parmesan cheese and white truffle". which truffle hunting tour did you go to? We are a company that deals with the harvesting of truffles in Romania, with a capacity of over 300 Kg / week, the meadow truffle in summer and autumn. We are interested in a distribution in England, a serious collaboration. We are a frigotehnic car, so we can transport weekly anywhere in Europe. We hold official and originating documents, as well as sanitary authorizations. Truffles are delivered at a common price for all categories.